Create a more toned facial contour with A'kin Cellular Radiance Booster Rejuvenating Oil, a revitalising treatment that combines seven Certified Organic oils and plant extracts. The silky face oil absorbs effortlessly to help replenish hydration, improve elasticity and balance the skin tone. Enriched with Jojoba, Macadamia, Sea Buckthorn and Rosehip, the formula works to smooth the skin surface and restore firmness for a radiant and youthful appearance. A pipette dropper ensures convenient application on the go. 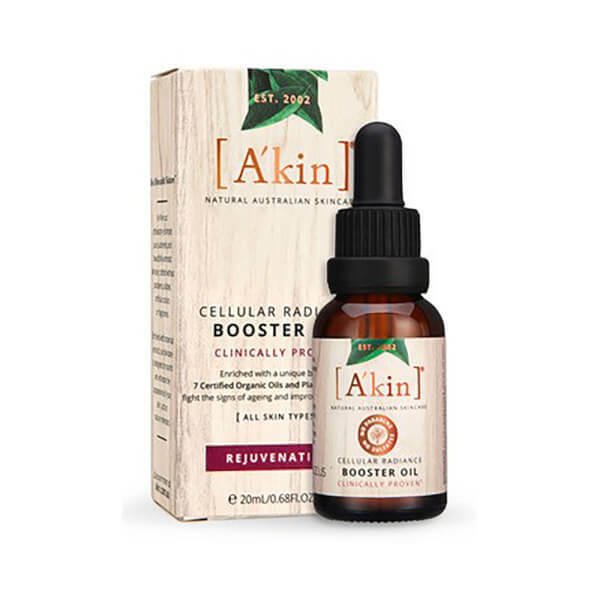 Apply 3-4 drops & gently massage onto your face, neck and décolletage prior to moisturising. 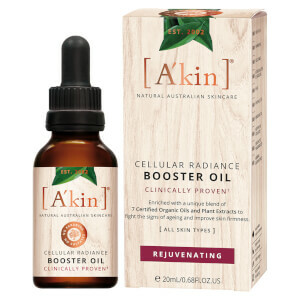 Rosa Canina (Rosehip) Seed Extract+^, Echium Plantagineum Seed Oil*, Ethyl Macadamiate*, Squalane*, Simmondsia Chinensis (Jojoba) Seed Oil*, Macadamia Ternifolia Seed Oil*, Hippophae Rhamnoides (Sea-Buckthorn) Fruit Extract*^, Amaranthus Caudatus (Amaranth) Seed Extract+^, Punica Granatum (Pomegranate) Seed Extract+^, Bisabolol, Rosmarinus Officinalis (Rosemary) Leaf Extract+^, Chamomilla Recutita (Matricaria) Flower Extract+^, Calendula Officinalis Flower Extract+^, Helianthus Annuus (Sunflower) Seed Oil*, Schizandra Sphenanthera Fruit Extract+^, Tocopherol (Vitamin E), Beta-Carotene*, Caprylic/Capric Triglyceride*, Malic Acid* +Certified Organic.